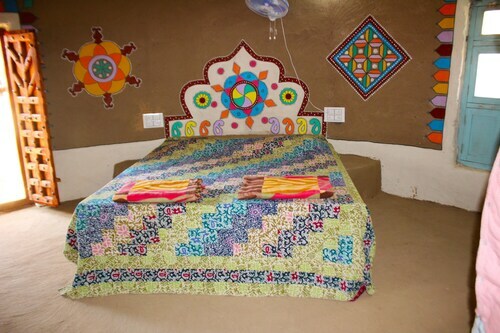 Have you considered securing a Kutch holiday package? It's a piece of cake with Expedia, and you'll be able to buy a few fancy meals or presents for your friends back home with the cash you save. Up to 21.4%* can be saved when you book a package deal on Expedia. Our extensive database provides more than 400 partner airlines and 321,000 worldwide properties. With such a fantastic range to pick from, you really can't go wrong! Not 100% sure about your booking? There are no hidden fees from us when you change almost any reservation. Getting excited about your trip to Kutch? Keen for a few hints about what to do and see when you arrive? That's where we can assist! Hiking is a popular activity and a superb excuse to get out and experience more of the wider region. Still have some time to spare? Caving is another activity to stick on your travel itinerary. Bhuj Airport (BHJ) is the starting point for most visitors going on a trip to Kutch. It's situated 35 miles (56 km) from the heart of town. This hotel is in Bhuj.